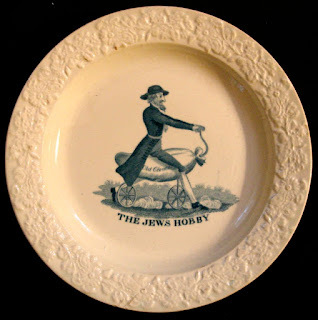 Dishy News - A Transferware Blog: CARICATURE AND HUMOR ON TRANSFERWARE OR PREJUDICE? 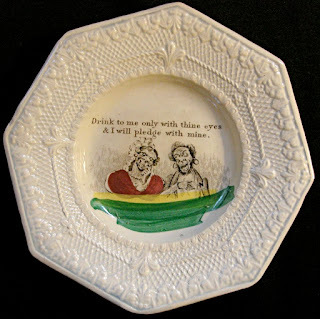 CARICATURE AND HUMOR ON TRANSFERWARE OR PREJUDICE? I have been reading Chimamanda Ngozi Adichie's superb book, "Americanah." It is about many things, but it got me thinking about prejudice and caricature. 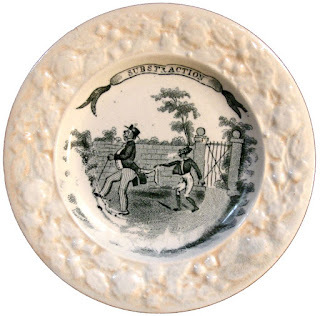 It also made me reassess the few transferware patterns that I found too racially loaded, as well as disgusting to me personally, for the TCC Pattern and Source Print Database. You need to know that I am not particularly squeamish about patterns that represent 19th century life and beliefs. I do not believe in censorship. However, I think racially distorted pictures are offensive and can fuel the flames of prejudice. Or, perhaps they are they a jumping off place to talk about prejudice (especially as the patterns shown here were made for children). The pattern below is part of a series that makes fun of people and/or occupations while focusing on the craze of hobby riding that was popular in the 19th century. (A hobby is a forerunner of the bicycle, invented by Baron Karl von Drais. In 1818, a London coach-maker named Denis Johnson began producing an improved version, which was popularly known as the "hobby-horse." 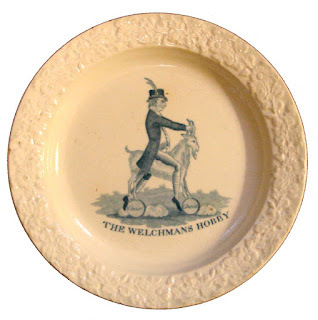 Another name for this vehicle is the velocipede). All the patterns are supposedly humorous, but the pattern below goes beyond humor to ethnic stereotyping. The "Jew" is riding a bag of "Old Clothes" or perhaps it is a bag of money. He has an exaggerated hooked nose and scraggly beard. He reminds me of the 1930s Nazi propaganda caricatures of Jews. 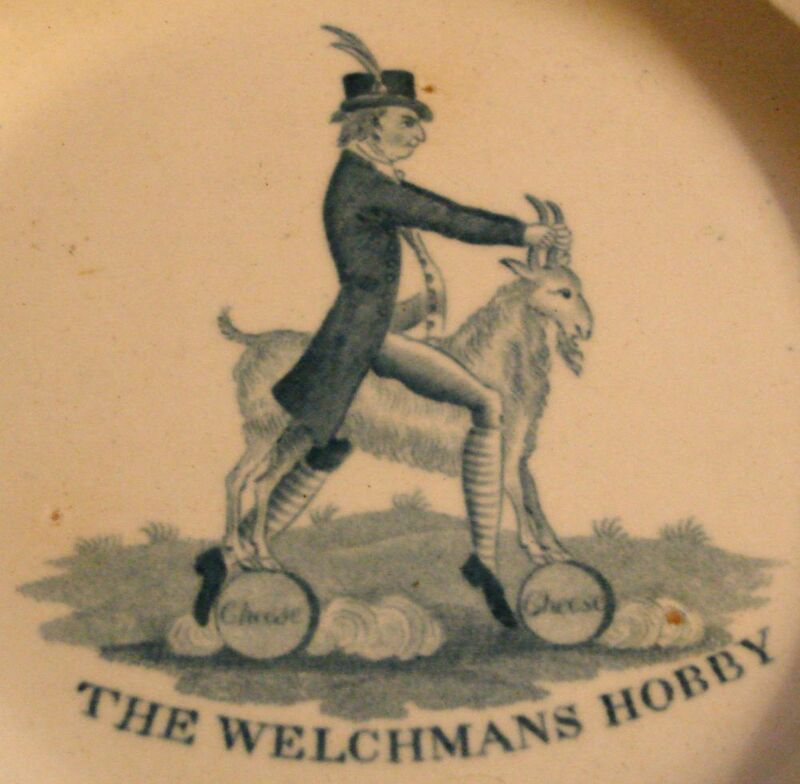 "The Welchmans Hobby" is equally loaded with caricature, but the goat and cheese wheels soften the caricature. Noel Riley in her book "Gifts For Good Children" shows 6 patterns in this series, including "The Jews Hobby." The other patterns poke gentle fun at the sailor, the dandy, John Bull, the alderman, and the doctor. 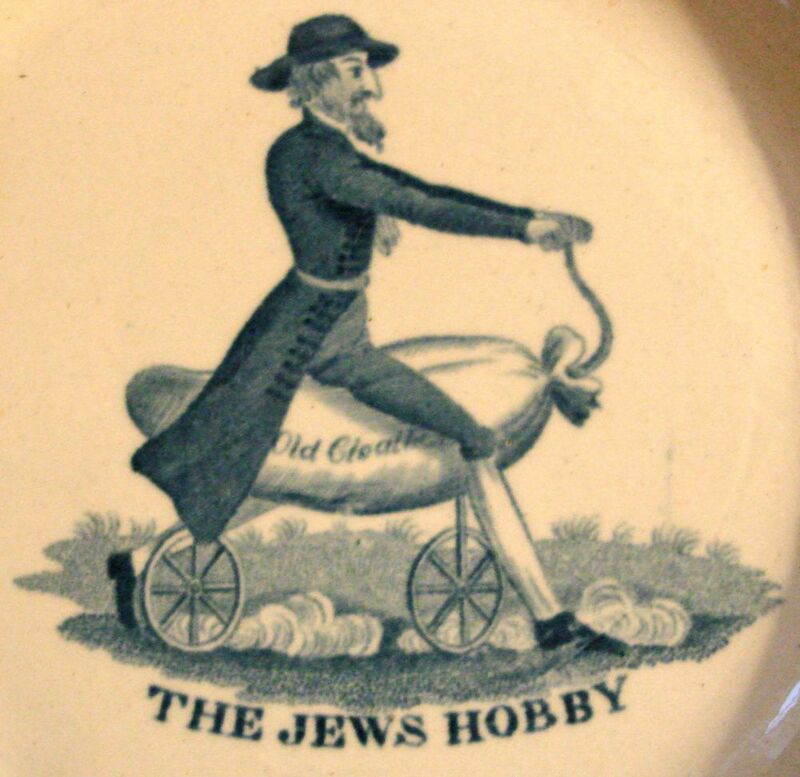 Perhaps "The Jews Hobby" was considered funny in the 19th century. Another series of patterns, which were made to teach arithmetic to children in a humorous way, uses caricatures of Africans to portray the subject. 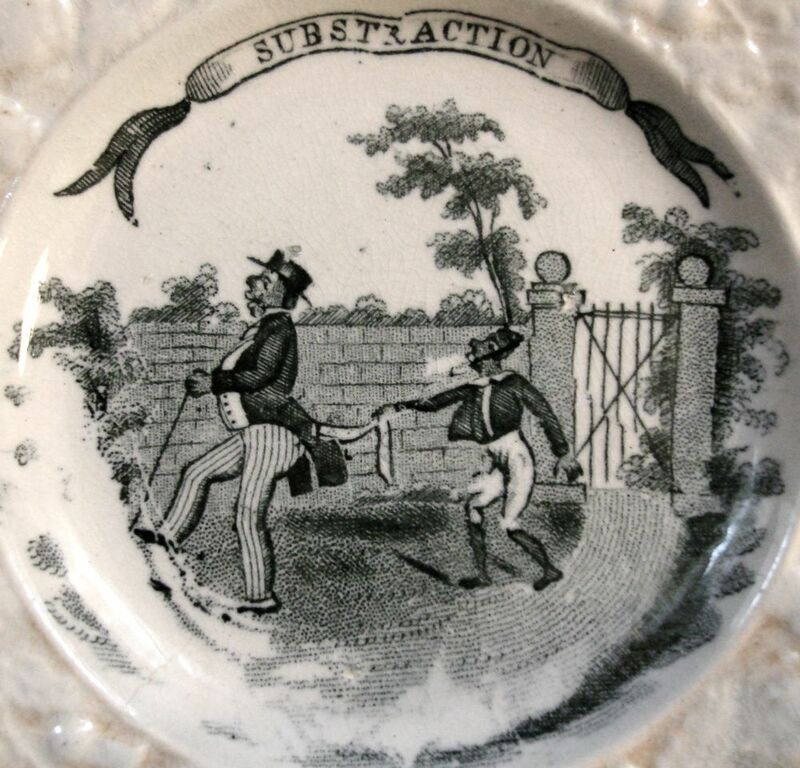 "Subtraction," for example, shows a child stealing a wallet from a man. Both characters have exaggerated African features, and the act of stealing is a poor example of "subtraction." At least to me. Noel Riley shows six patterns in this series, including decimal, division, multiplication, improper fractions and division. 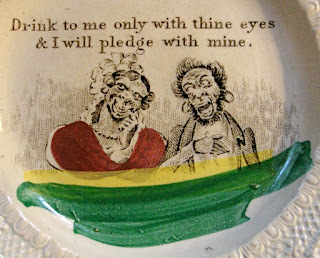 The last is a pattern with the words "Drink to me only with thine eyes & I will pledge with mine," which is an old English song. The lyrics are from Ben Jonson's "Song To Celia" (1615). The poem and song are lovely, but the exaggerated features of the African people on the plate are not. Is this appropriate humor? Or, an appropriate pattern for a child? I don't think the intent of the potters was to promulgate prejudice, but the stereotypes that they printed on plates for children fueled the flames of the ridicule of minorities.